We love that camera on our iPhone, don’t we? We take pictures all day. If we hate it, we delete it; if we love it, we keep it as a beautiful memory. But mistakes do happen. Accidents do happen. It has happened to most of us. Though accidentally, but we might delete photos which were meant to be kept. 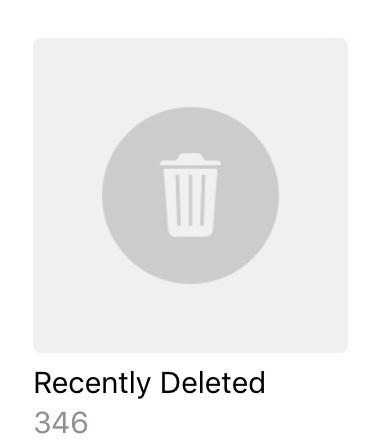 Sometimes we get impulsive and start deleting photos to free up some space, only to realize later that some of the photos, which got deleted, were not meant to be deleted. Now before you give up by telling yourself that it is not possible to recover deleted photos from the iPhone, wait. It is possible. And not just possible, it’s easy too. Happy? 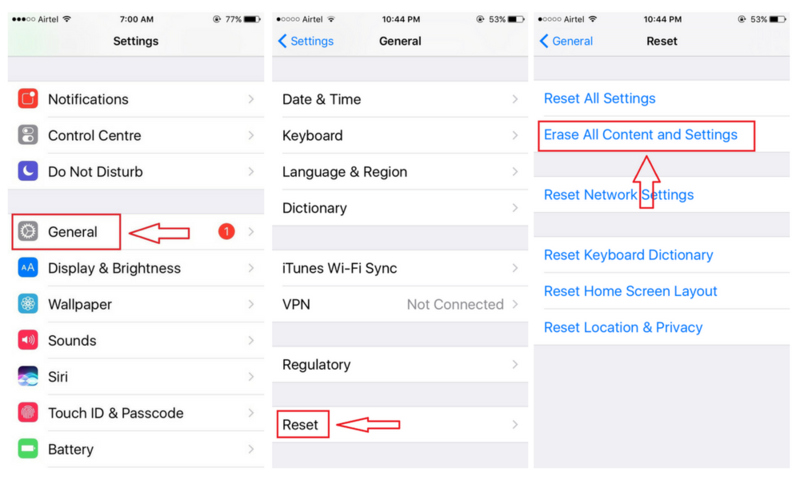 So, how to recover deleted file from iPhone? I am going to show you 7 easy and possible ways to retrieve deleted photos from iPhone. Android user? You are on the wrong page. This is what you should be reading. Before we move, there are a few things which you should keep in mind before trying any of these methods. a. Please stop using your iPhone for the time being. You don’t want to overwrite your device by using it or else these methods might not work. b. Avoid internet connectivity for the time being. The best thing that you can do is to put your iPhone into Airplane Mode. Note: This method is applicable only if your iPhone is running on iOS 9 or later. 1. Go to your iPhone’s Settings. 2. Scroll down a bit and tap on General. 3. Tap on About at the top. 4. Here, you’ll see your iPhone’s basic information like storage, IMEI number, Carrier, among other things. Look for Version. If the number alongside version starts with 9 or 10, then this method will work for you. If that’s not the case, please move on to the other methods. Very few people know about this, but starting from iOS 9, iPhone users have an additional album in their Photo Library. And that album is called Recently Deleted. Whenever you delete a photo or a video, obviously it gets deleted but not exactly gets lost. The deleted photo or video goes into the album Recently Deleted. It stays there for 30 – 40 days and after that gets deleted automatically. And permanently. We get a window of 30-40 days. If you deleted a photo and it’s been more than 40 days, then this method is not of any use to you. 2. Tap on Select on the upper right corner. 3. Select the photos which you would like to recover and then tap on Recover. You can tap on Recover All if you want to recover all of the photos in a single tap. Remember that if you delete photos from ‘Recently Deleted’ album, then it can be recovered only through the other methods. Note: This method will work only if you’ve backed up your iPhone with iTunes before deleting the photos. 1. Launch iTunes on the PC that you used to back up your iPhone. 2. Connect your iPhone to PC with the help of USB Cable and wait till iTunes recognizes your device. 3. Once iTunes recognizes your device, Select your device. 4. Click on Restore Backups. 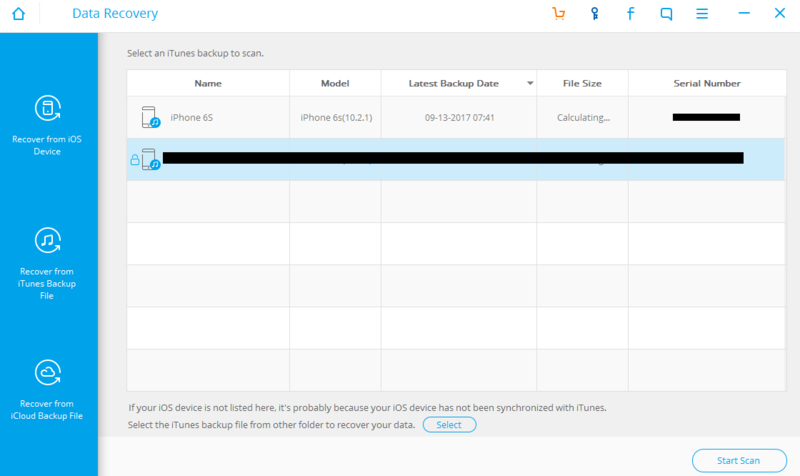 5. iTunes will then show you the dates and time of all the back ups available. Select the most relevant back up. It is needless to say that you would like to select the latest back up. 6. Click on Restore and wait till iTunes is done with restoring. iTunes might ask you to turn off ‘Find my iPhone’ before restoring. You can do that by going into Settings>>General>>Find My iPhone. Turn off Find My iPhone, it will ask you for your Apple ID password. Type in your Apple ID password and tap on Turn Off. It might take a few minutes. Your iPhone will restart automatically. 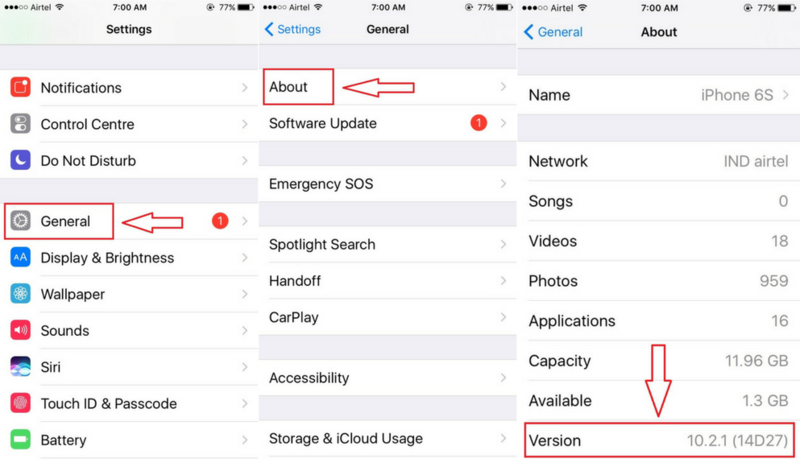 After the iPhone is rebooted, iTunes will sync data with iPhone. Once iTunes is done with syncing, you will find all the lost photos back in your iPhone’s Photo Library. Disclaimer: Please proceed with this method only if those deleted photos are too important because for this method you will have to reset your iPhone. Note: This method will work only if you had an iCloud back up before deleting the photos. 3. Find Reset at the bottom of the page and tap on it. 4. Tap on Erase All Content and Settings. Here also you’ll be asked to give your Apple ID’s password. 5. iPhone will restart. Go through all the setup procedures until you reach Apps & Data. 6. Once there, tap on Restore from iCloud Backup. 7. You’ll be asked to Sign-in to your Apple ID. Fill up the credentials and move ahead. 8. Select the most recent backup, according to the date and time. 9. It will take a few minutes to completely restore your iPhone, depending on the size of the backup. 10. Once your device has been restored, finish with the remaining setup procedures. Don’t be afraid if you don’t see your photos instantly, as it might take a few hours to completely restore your iPhone. Apart from the above methods, there are also some great tools which you can use to retrieve deleted photos from iPhone. And by iPhone, I mean any iPhone. There are many tools out there, but I’ve curated 4 of the best tools that actually work. Not forgetting to mention, these tools will work irrespective of iOS version. Dr.Fone – iOS Data Recovery is a great tool when it comes to recovering deleted photos from iPhone. And not just photos, it can also retrieve Videos, contacts, messages, call history and more. 1. Download and install Dr. Fone – iOS Data Recovery from here. 2. Click on Data Recovery and connect your iPhone to PC with USB Cable. 3. Now you have three options here. 4a. Click on Recover from iOS Device after connecting your iPhone with PC. 4b. Click on Start Scan. The application will take a few minutes to scan your device. 4c. Once the scanning is completed, click on Photos from the left panel. 4d. This will bring up all the deleted photos along with the existing photos on your device. Select the photos which you want to recover. 4e. Click on Recover to Computer. 5a. Click on Recover from iTunes Backup File and connect your iPhone to PC. 5b. Select the appropriate backup file and then click on Start Scan. 5c. Once the scanning is completed, click on Photos from the left panel. 5d. This will bring up all the deleted photos along with the existing photos on your device. Select the photos which you want to recover. 5e. Click on Recover to Computer. 6a. Click on Recover from iCloud Backup File and connect your iPhone to PC. 6b. Sign in to iCloud by giving Apple ID and Password. 6c. Select the appropriate backup file and then click on Start Scan. 6d. It will start downloading the backup. This might take some time depending on the size of the backup file. 6e. Once the downloading is finished, click on Photos from the left-side panel. 6f. Preview photos, select the photos which you want to recover and then click on Recover to Computer. 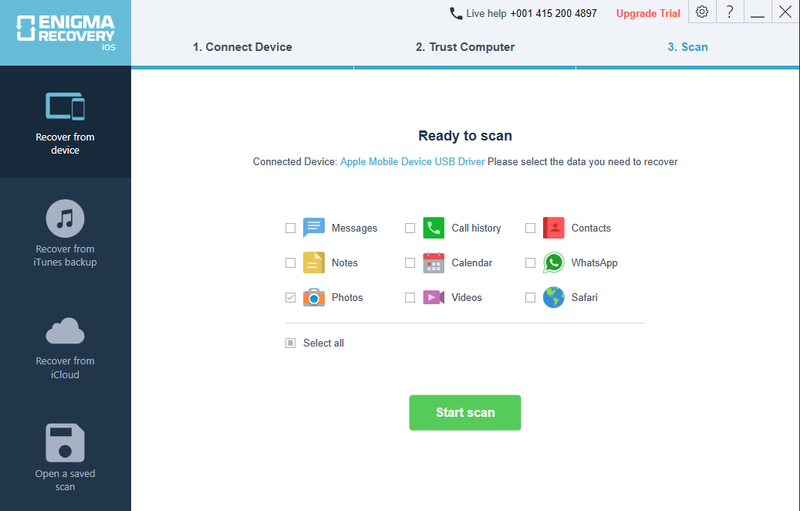 EaseUs MobiSaver is a lot like Dr.Fone Toolkit. 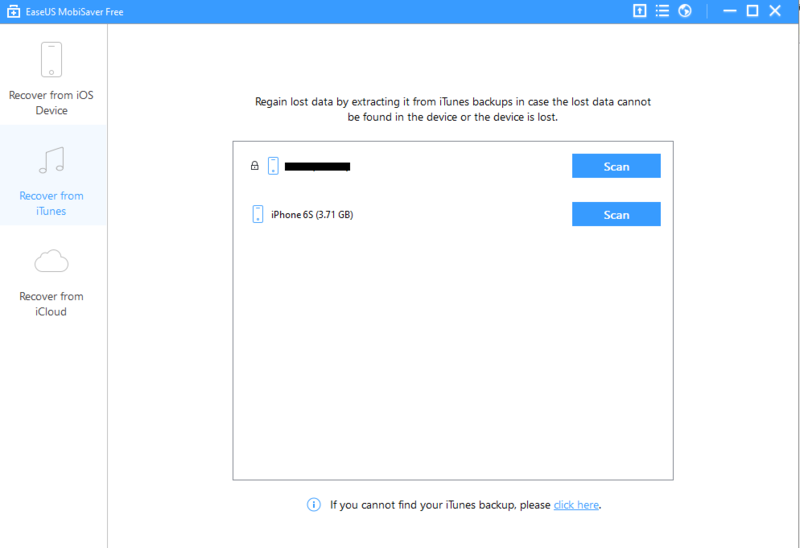 In this software too, you will find three options to recover – from your iOS device, from iTunes backup and iCloud Backup File. 1. Download and install EaseUse – MobiSaver from here. 2. Open EaseUs and connect your iPhone to PC. 3a. Click on Recover from iOS Device and then click on Scan which appears right alongside your device’s name. 3b. It will take anywhere around 5 – 10 minutes to scan your device. 3c. After the scanning is done, select Photos from the left-side panel. 3d. Preview your photos, select the photos which you want to recover and then click on Recover. 4a. Click on Recover from iTunes. 4b. The Application will then come up with the most recent iTunes back up file of your phone. Select the backup file and Click on Scan. 4c. It will take anywhere around 5 – 10 minutes to scan your device. 4d. After the scanning is done, select Photos from the left-side panel. 4e. Preview your photos, select the photos which you want to recover and then click on Recover. 5a. 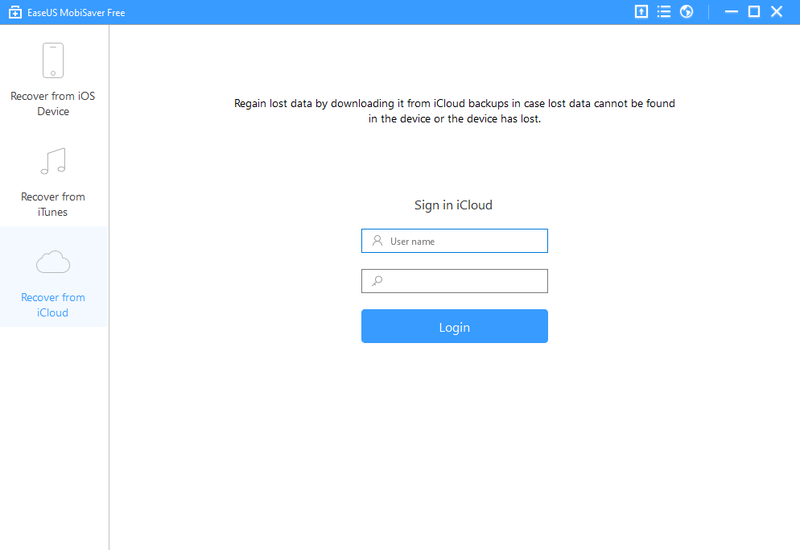 Click on Recover from iCloud. 5b. 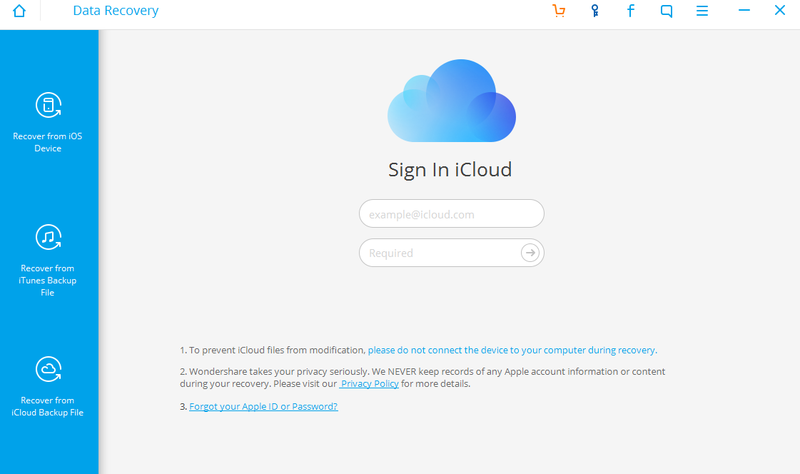 Sign in with iCloud using your Apple ID and Password. 5c. Select the most appropriate backup and click on Scan. 5d. The program will then start downloading and extracting the backup file. It might take a few minutes depending on the size of the backup. 5e. After the scanning is done, select Photos from the left-side panel. 5f. Preview your photos, select the photos which you want to recover and then click on Recover. PhoneRescue is another great tool to recover deleted photos. 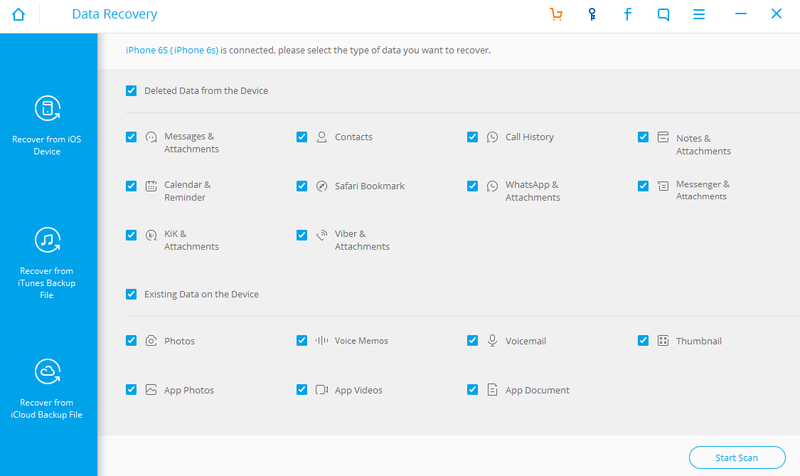 And not just photos, you can also recover contacts, messages, videos, notes, WhatsApp and Kik conversations, etc. 1. Download and Install PhoneRescue from here. 2. Launch the application and connect your iPhone to PC. 3. Just like the previous two applications, PhoneRescue also gives you three options to recover lost photos. 4. Click on the Right-Arrow that you see at the bottom right corner. 5. Select Photos from the box and then click OK.
6. It will take a few minutes to analyze and scan your device. Be patient. 7. Once the scanning is done, the application will come up deleted photos. Preview the photos, select the photos which you want to recover. 8. You can either recover it directly to your iPhone or to your PC. The choice is yours. 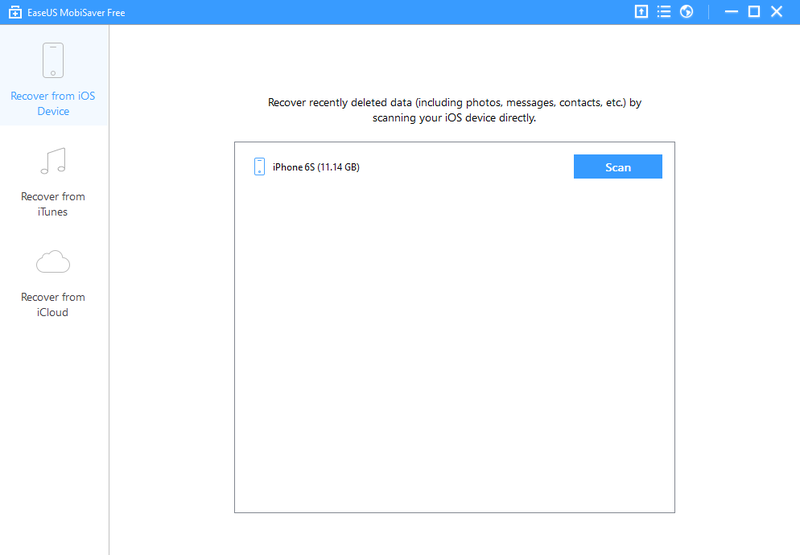 Remember, you can also recover deleted photos from iTunes and iCloud backup using PhoneRescue. The procedure is pretty much the same with that of the previous applications. 1. Download and install Enigma Recovery from here. 3. Again, in this application too, you get three options. The procedures are synonymous with previously mentioned applications. 4. When the PC recognizes your iPhone, the application will automatically start scanning your device. By default, it starts looking for all files but you can click on Cancel and just select Photos to save time. 5. The application will start analyzing your device. It can take around 3 to 4 minutes. 6. Once done with analyzing, you can preview your photos. 7. Select the photos which you want to recover and then click on Recover. 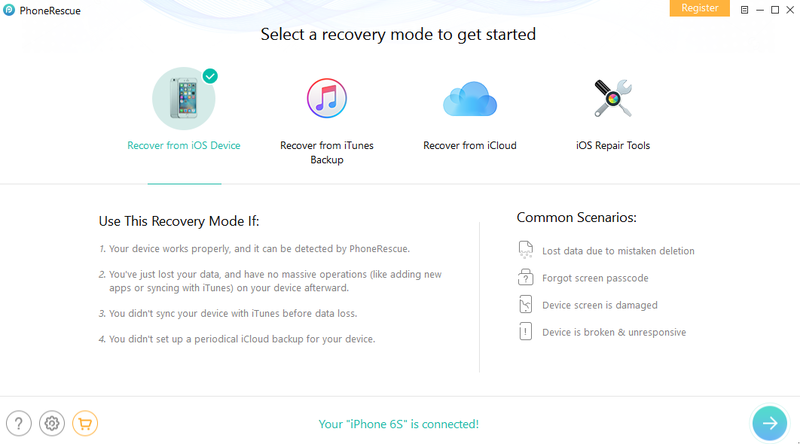 Apart from recovering lost files from the device, you also have the option to recover from iTunes and iCloud backup file. I hope that above methods worked for you and you were finally able to get the answer to the question How to recover deleted photos from iPhone? If in case you were not able to retrieve photos from your device, then please let me know through comments. Did you find this article useful? Do you have any other method in your find which worked for you? Share your thoughts in the comments section below. And don’t forget to share this article with your friends and family on different social networks. Hey, Can it be used for iPhone 7 too. ?? All of the above methods work for iPhone 7 too.